We would like to introduce “ Billion Food Co.,Ltd. Korea “ to you. 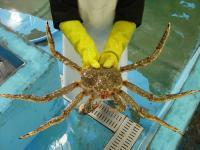 Our company is professional seafood exporter including Live King Crab and Live Lobster. We ship King Crabs to L.A (USA), Vancouver (Canada), HKG, China, Singapore, Taiwan, Malaysia, Vietnam and Indonesia. Our excellent quality is well known among overseas customers. We would like to expand our business and we believe your company is suitable to do this business with us. Please inquire us your interests of our Live King Crab or Live Lobster (US & Canada). We provide our clients with your at the most affordable price. The product we are dealing with is Russian Live King Crab. If Russian king crabs are not available, we provide Norwegian Red King Crab instead. So we can supply all year round. Regarding Russian king crabs, we will have Blue king crabs from Jan to Jul, and Red king crabs from Sep to Dec. We are only handling A grade king crabs with high meat content. We have been in this industry for over 18 years and we know how to store king crabs in the best condition. Every second, we check the temperature and the salinity from our water pools to make king crabs stay in the highest quality. This is connected to the result of less than 5% of mortality rate when received by our customers around the world.